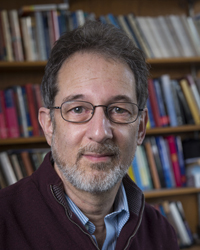 PITTSBURGH—Richard Scheines, professor and head of the Department of Philosophy at Carnegie Mellon University, has been selected to lead the Dietrich College of Humanities and Social Sciences as dean, effective July 1, 2014. He will succeed John Lehoczky, who has served as dean since 2000 and will return to the Department of Statistics' faculty. "As a scholar, teacher, colleague, administrator, and forward-looking leader, Richard Scheines is extraordinarily well suited to be the Dietrich College's next dean," said Mark S. Kamlet, provost and executive vice president. "He has a long history of collaboration on research and education both within Dietrich College and across campus, and he is just the right person for this leadership role on campus." Since 2005, Scheines has led the Philosophy Department to distinction with a focus on research that directly connects to a wide array of other fields, including computer science, math, statistics, brain science, medical ethics and psychology. Under his leadership, the department more than tripled its external research funding, strengthened its global reputation and attracted and retained the highest quality faculty and students. He also was instrumental in working to establish a new Center for Formal Epistemology, which collaborates with similar centers at Stanford University and in Europe and Japan. Additionally, he is credited with helping to create the Patrick Suppes Chair — now held by Wilfried Sieg — developing a new interdisciplinary major in linguistics, and working with the Department of History to upgrade the ethics, history and public policy major. "Richard Scheines shared detailed and creative strategies for advancing both the humanities and social sciences," said G. Richard Tucker, the Paul Mellon University Professor of Applied Linguistics who chaired the college's Dean Search Committee. "He is particularly well-connected across programs, colleges and academic institutions, for example, the Human-Computer Interaction Institute, the Machine Learning Department and the University of Pittsburgh. He is also well poised to lead the learning sciences as part of The Simon Initiative." Scheines joined the CMU faculty in 1990 and has additional appointments in the Machine Learning Department and Human-Computer Interaction Institute (HCII). His research focuses on causal discovery, the philosophy of social science, and educational technology and online courses. With CMU's Peter Spirtes and Clark Glymour, Scheines pioneered the development of the modern theory of statistical causal models, which have been successfully applied in fields from genetics to climate modeling, brain imaging to social psychology and educational research to economics. He led the design of the undergraduate major in human-computer interaction, and, with the late Steven Klepper, he redesigned a core methods course in social and decision sciences that received honorable mention in the American Statistical Association's Causality in Statistics Education Awards. In technology-enhanced learning, Scheines directed the creation of two online courses and published the first empirical study to show that appropriately applying interactive, web-based instruction can lead to improved learning outcomes in college courses. He also has played a major role in the development of the university's new Simon Initiative, which aims to accelerate the use of learning science and technology to improve student learning, and to harness and leverage CMU's decades of learning data and research to improve educational outcomes for students everywhere. Scheines has served on three committees for the National Academies of Science, two of which have completed their work and published books describing their findings: "Improving the Presumptive Disability Decision-Making Process For Veterans" and "Food Marketing to Children and Youth: Threat or Opportunity." "I can't imagine a more intellectually exciting place to work than Carnegie Mellon," Scheines said. "I've benefitted enormously from the value put on interdisciplinary work and from the astonishing variety of expertise available within a 5-7 minute walk from my office. I will do everything I can to create an environment that is exciting and enjoyable for all of our faculty and students. I'm quite sure I will learn a lot from the journey." For more information on Scheines, visit http://www.hss.cmu.edu/philosophy/faculty-scheines.php. Watch a video in which Scheines and other CMU faculty members, students and alumni discuss the Dietrich College's strengths in the humanities at http://youtu.be/oW5PCG4hydc. Since 2005, Richard Scheines (pictured above) has led the Philosophy Department to distinction with a focus on research that directly connects to a wide array of other fields, including computer science, math, statistics, brain science, medical ethics and psychology. Under his leadership, the department more than tripled its external research funding, strengthened its global reputation and attracted and retained the highest quality faculty and students.